A few hours ago the NFL confirmed the 2014 halftime headliner will be Bruno Mars. I remember the first time I heard Bruno on the radio back in 2010; it was on the Travie McCoy "Billionaire" track. I fell in love with this dude at that very moment. I for one am really looking forward to the 2014 super bowl...come on February! Bruno just finished up his Moonshine Jungle Tour in the US/Canada and is set to start his UK/Europe tour in October. 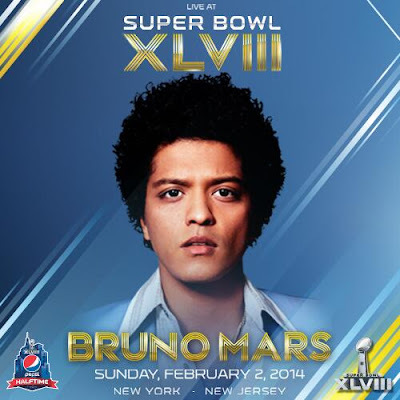 Check out the official NFL.com Super Bowl XLVIII video announcement HERE! Check out more music videos from the Bruno Mars YouTube channel here.